I’m talking about chewing! 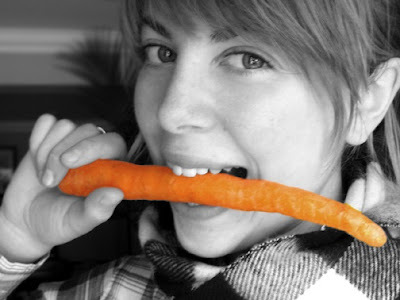 When did we all stop eating mindfully and actually using our teeth? These days it’s hard to find time to eat, let alone do it “properly” so I thought it would be a good idea to remind us all why chewing is so important to our health and how to get back to masticating like we should. Chewing your food properly is the first step in the process of digestion, which extracts the nutrients from what you eat. The bottom line is: the more you chew your food, the more nutrients will be available for your body to absorb. There’s no point in dropping extra cash on organic food, if you don’t even chew it up! 1. Chewing cleans your food before it hits your stomach since saliva is antibacterial. Certain food-borne bacteria can be killed just from chewing! 2. When you eat, it takes a while before satiety (“fullness”) signals reach your brain and tell you that you’ve had enough. If you rush your meals you will eat much more before these signals kick in, resulting in your consuming more food than you need. Just by slowing down when you eat you will more likely to eat less (apparently some people want to do that). 3. According to university studies, chewing stimulates the endocrine system, keeping your hormones in balance for a happier, younger-looking you. In particular, the parotid glands just under your cheekbones release a cell-rejuvenating substance, which gives you that youthful glow. 4. Chewing decreases your risk of indigestion and gas. By increasing the surface area of your food, the enzymes in your saliva can begin digestion earlier and prevent your stomach from working too hard. Also, when you chew slowly, you take in less air. You won’t champion the next belching contest at the pub, but that’s not something to be proud of anyway. 5. The more you chew, the more oxygen is sent to the brain. So take your time and give your meal a thorough munching if you want to keep your mind sharp and avoid those post-meal sleepies. 6. Scientists have also discovered that munching is magnificent for the memory. It may help keep dementia in the elderly at bay. It seems that the more you chew, the more short-term memory cells you develop. When people get older, they lose their teeth and start eating mushy foods. The short-term memory may be compromised because of this simple change in diet and behavior. Isn’t that amazing? So it turns out grandma was right. Chewing sufficiently does make a difference in how we feel and even look! For best results, try chewing each bite 30 times or more. At first this may seem too time consuming, but remember that eating should be done without hurry anyway. Enjoying the flavour and texture of each bite will bring awareness and gratitude to the act of eating and you’ll naturally slow down. I like to chew my food until it’s liquid simply because I know that I am doing my body a huge favor – last time I checked, I didn’t have teeth in my stomach! Nice post! Can you maybe indicate the literature that you mention in your blog post? very clever! I brush my teeth every day! Dentist.net is running a sale on everything with the promo code OralCare … it’s 10% off. Check it out! Coincidently, I read your post while eating a toasted bagel and for obvious reasons, became quite conscious of my mastication (sp?) habits. I have to admit, I couldn’t get to 30 chews but I came closer than I usually would. The picture turned out great!